Published by Cyril Huze January 25th, 2018	in Accessories, Customs and Editorial. New Gloss Black Precision Engine Covers from Kuryakyn take blacked-out Milwaukee-Eight® power plants deeper to the dark side. Now available in smooth gloss black, Precision covers serve as an extension of the Milwaukee-Eight’s design language, enhancing the sinister look of Harley-Davidson® “Special” and CVO Touring models, as well as the Gloss Black Engine Cover Kit (H-D P/N 92500059). The modern and muscular designs deliver a truly defined appearance for a seamless integration with every factory component, whether used individually or as a complete set. Everything in the Precision line is bolt on. The collection includes groupings of unique covers and accents that bring the same powerful appearance to often-overlooked areas of the engine and transmission. Focus areas include, among other areas, the cylinder base, inner primary, tappet blocks, transmission and starter, as well as the voltage regulator, oil cooler, and coolant pump (for liquid-cooled models). Kuryakyn Precision Line. Now that Samson is under new ownership wonder if they will be designing pipes for the M8, seem like great guys you can actually talk to. Looking good! 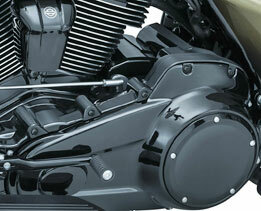 I’m really liking what I’m seeing with the M8 engine and the improvements on the new Harley’s in general. It’s easy to see some of this was in competition with the now defunct Victory’s. Competition is great for the consumer!